But HIMSS Analytics director Brendan FitzGerald says you do need a core set of tech tools to get the job done. While electronic health records are the most common tool healthcare entities are implementing to enable population health management programs, there are other technologies proving critical as well. 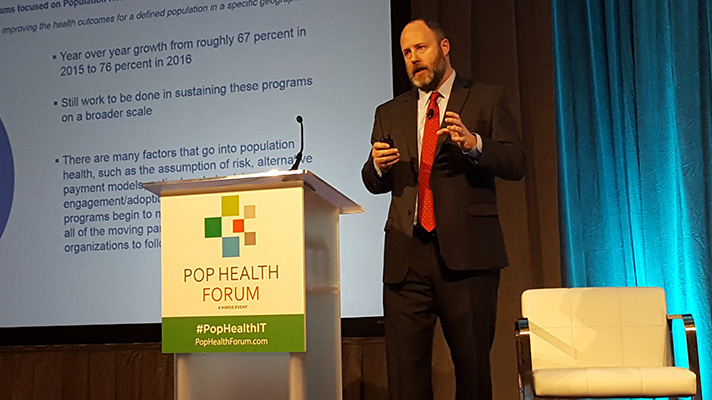 “A wide swath of technologies are being used,” HIMSS Analytics research director Brendan FitzGerald said at the Pop Health Forum in Boston Tuesday. FitzGerald explained that EHRs are top of mind, followed by patient portals and patient engagement tools. The fourth most popular is manual care management. Read more of our event coverage. Others include data aggregation software, health information exchange products, as well as business intelligence and analytics programs. FitzGerald shared results from HIMSS Analytics second population health survey, which found that while 67 percent of participants had a population health initiative in place in 2015, that number rose to 76 percent in 2016. Among survey respondents, nearly half have up to three population health initiatives in place and chronic disease management, wellness and preventative health and clinically integrated networks are the most common reasons. The increase in population health efforts, along with the decrease in lower levels of risk and increase in higher risk that HIMSS Analytics found, are signs that health systems are maturing their approach. That said, technology challenges remain, including a lack of understanding IT, a need for solution standards and specific functions to improve analytics for risk contracts, reporting and performance measurement, and care coordination, FitzGerald said.